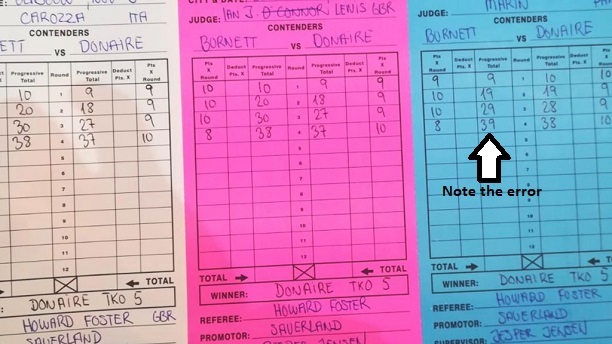 Ryan Burnett [19(9)-1(1)] was winning his fight with Nonito Donaire before injury intervened. The Belfast bantamweight was forced to retire on his stool after the fourth round last night at the SSE Hydro in Glasgow. What has been described as a ‘freak injury’ either occurred or was aggravated in the fourth round of their WBA title and WBSS quarter-final clash leaving Burnett in considerable pain and with no way back. The Irishman was leading on all three cards at the time of the injury and on two of the cards at the time of the stoppage. Burnett was 30-27 up with judges Stefano Carozza (Italy) and Ian John Lewis (UK) and 29-28 up with judge Alexs Marin (Panama). Burnett seemed to be complaining of an injury in the corner following the third and his fight would come apart in the fourth. Throwing a right hand, Burnett looked to have suffered a hip injury, perhaps aggravating what he had previously complained of, and he would spin away and take a knee. Beating the count, Burnett managed to survive the round – a 10-8 to Donaire on all three cards due to the ‘knockdown’ – but was pulled by his corner as the fifth started. This meant the final cards after four rounds were two 38-37s in favour of Burnett and one 38-37 for Donaire who moves to 39(25)-5(1) and a unification with WBO champ Zolani Tete in the new year. The fight is officially ruled a TKO after one second of the fifth round. The first three rounds were keenly contested but, from this publication’s perspective, Burnett was edging proceedings with sharper work. It should be noted, however, that plenty ringside in Glasgow felt Donaire was the man on top. The Antrim Road 26-year-old’s injuries remain unclear at this time. A big bodyshot from Donaire with 30 or so seconds to go in the third caused Burnett to momentarily sink and he would go on the retreat for the rest of the round. A working theory, albeit just that, is that Burnett suffered an injury to his right hip here which he could be heard complaining about in the corner at the break before exacerbating it bady when throwing in the fourth.